I wanted to share a few updates regarding response measures and efforts in the aftermath of Hurricane Florence. With my support, the House of Representatives passed H.R. 302, Federal Aviation Authorization Act of 2018 which included a $1.68 billion down payment for Hurricane Florence disaster relief. The relief includes $1.14 billion in Community Development Block Grant  Disaster Recovery (CDBG-DR) Program funding for North Carolina to support recovery activities such as housing redevelopment and rebuilding, business assistance, economic revitalization, and infrastructure repair. I thank the House leadership, the appropriators and my other colleagues for working with me and the rest of the North Carolina Delegation during the past two weeks since Hurricane Florence hit to put together this initial disaster recovery package. The swift action Congress took this week is the first step towards supplementing recovery efforts at the local and state levels by providing an additional $1.14 billion for North Carolina through the Community Development Block Grant (CDBG) Disaster Relief program, which provides the most flexibility for the state to best address recovery needs. 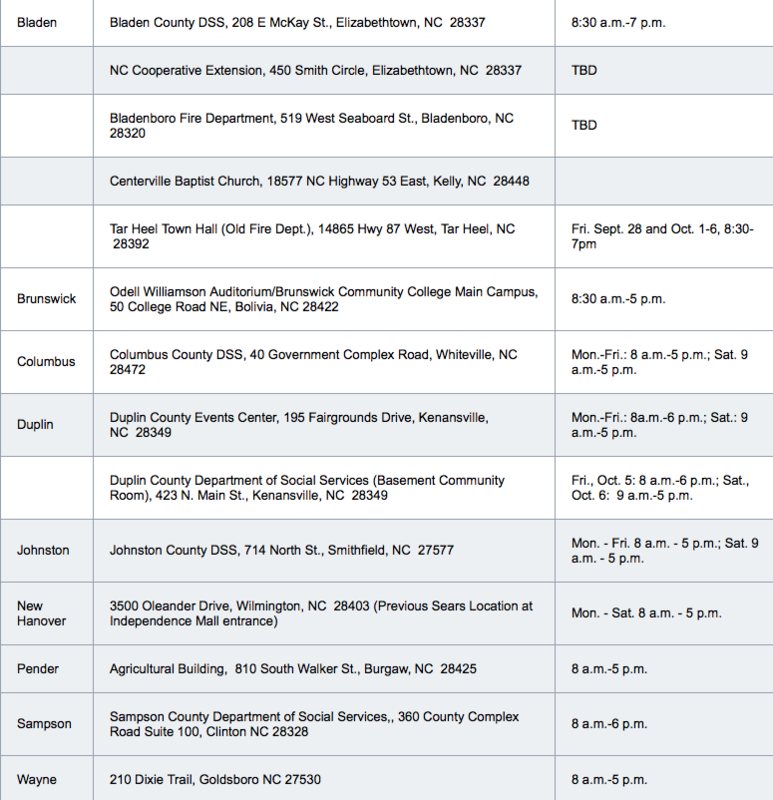 The Division of Employment Security (DES) announced that the following counties have been approved for Disaster Unemployment Assistance (DUA) due to the effects of Hurricane Florence: Bladen, Brunswick, Columbus, Duplin, New Hanover, Johnston, Pender, Sampson, and Wayne. Individuals from these counties who are affected by the disaster, and are unable to continue working, must file an application for benefits by October 18, 2018. Additional counties may be added at a later date. If your county has not been approved for Disaster Unemployment Assistance, please continue to monitor our website as we will post updates as we receive them. Not currently be receiving help buying food through the Food and Nutrition (FNS) program. People receiving FNS can also get extra help buying food, but do not need to fill out a D-SNAP application. They can get more information about how to get the extra help by clicking here. Eligible households will receive a one-time benefit on a special debit card to help buy food. The exact amount will depend on household size, but a family of one would receive $192, a family of four would receive $640 and larger families would receive more. Those wishing to apply must do so in person at your county’s designated application site. To access the application, please click here. Those wishing to apply can bring the application with you, or you can fill out an application when you arrive. Residents will meet with county Department of Social Services staff to process your application. If eligible, a card will be given to you to buy food. The application window to apply is Friday, September 28, 2018 through Saturday, October 6, 2018. All application sites will be closed Sunday, September 30. For more information, please click here. You can also call 211 for information about application locations. Johnston County has been approved as a designated county eligible to receive FEMA individual assistance and public assistance. In addition to Johnston County, the following counties in the 7th District are eligible for both individual and public assistance -- Bladen, Brunswick, Columbus, Duplin, New Hanover, Pender, Sampson and Wayne counties. -Use the address lookup on DisasterAssistance.gov to find out if you qualify for aid. -Fill out the DisasterAssistance.gov questionnaire and online aid application. -Call 1-800-621-3362; those who have a speech disability or hearing loss and use TTY, call 1-800-462-7585 directly; for those who use 711 or Video Relay Service (VRS), call 1-800-621-3362. The U.S. Small Business Administration (SBA) announced the opening of a Business Recovery Center (BRC) in New Hanover County. Businesses can visit the Wilmington BRC to meet individually with SBA representatives and find out how a low-interest disaster loan can help them recover. Opens: Monday, Sept. 24 at 12 Noon. Hours: Mon. to Sat., 8 a.m.  5 p.m.
Our four offices in Bolivia, Wilmington, Four Oaks and Washington, D.C. stand ready to assist you. Please visit our Hurricane Florence Resources and Information website for information on applying for disaster assistance, local emergency and disaster contact information, and more. Please call us if you have any questions or concerns. You can reach our Bolivia office by calling (910) 253-6111; our Wilmington office at (910) 395-0202; our Four Oaks office at (919) 938-3040 and Washington, D.C. office at (202) 225-2731.